This is set in the same universe as the Rivers of London series. If you’re not familiar with the series up-to-now, this is a good place to start. I liked that this fleshed out the setting in a much-needed way. I liked the murder-weapon. Someone’s using wine-making fungus to kill people in a magical ritualized fashion. I liked the length of the novella. It was short enough that there was basically no filler content. It was action-and-plot packed from cover to cover. I liked the blank slate of Tobias. He’s a new protagonist who hasn’t had 7+ books written about him. However I thought his personality could have been developed a little more. I wanted a bit more exposition and worldbuilding about magic in Germany. The author gave the reader enough to understand what was going in in the novel, but never as much to sate my curiosity. I got this book for free for the purpose of an honest review. 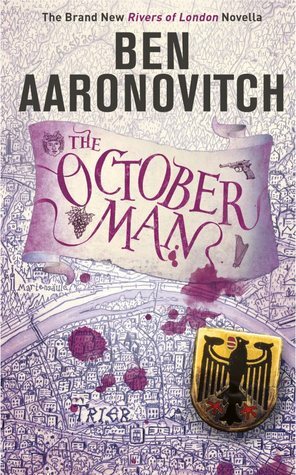 This novella is book 7.5 in the ‘Rivers of London’ series- though truth be told this book felt more like a side-branch of a new series. This is set in Germany and not London, and stars a brand new character. In fact there are no returning characters from the prior series. While there are numerous homages to the previous ‘Rivers of London’ books, this book doesn’t depend on those previous book. As a result, this book does stand entirely alone. I liked this book quite a bit, more than some of the more recent ‘Rivers of London’ books. When a body is discovered covered in wine-fungus mold, Tobias Winter is called in to investigate. Toby is the German equivalent of Peter Grant- a young apprentice wizard who solves magical crimes for the government. And this wine-fungus murder is most certainly magical, meaning poor Toby has his vacation called off so he can solve the case. Plot: I liked it. This is a tightly-plotted story of murder and mayhem in German wine-country. Winter and Sommer are two cops who must team up to discover who is behind the strange deaths, researching not only local criminals but also local folklore. The author does a good job of keeping the tension up by constantly throwing curve balls and bringing in new evidence. Pacing: the book doesn’t have any noticeable slow points. This is a Police Procedural genre novel pacing wise: body is discovered, talk with suspects, find evidence, expand suspect pool, find more evidence, reduce suspect pool, chase the murderer, the end. The author does a satisfactory job of following genre conventions in this way. Characterization: While I like Toby as a new POV character, I think he could have used more characterization. His father got more characterization in this novel, and his father never actually appeared in this book. If this gets more books in this sub-series, I would like the author to flesh his protagonist out more. My biggest piece of constructive criticism overall is that I wanted more details about Nazi-era magic use in this setting. It hung over like a cloud over the entire story, but the author never actually said what it was they did. Net total, I enjoyed it quite a bit. If you’re interested in reading a Police Procedural Fantasy, check this out.